The opening of schools on Monday, Aug. 24 meant a lot more students walking to their school, noted Amanda Day, and it also means more parents driving their kids to school and school buses delivering them. The fact that those motorists are aware that the kids are heading back to school, she said, hopefully serves as a reminder that they need to proceed slowly and cautiously on the roads. But just in case, she added, it helps to have the activities of Best Foot Forward as a safety reminder as well. Day is the project director of Best Foot Forward, a pedestrian safety initiative launched in June 2012 to reduce pedestrian deaths and injuries in Metro Orlando. Their goal has been to get drivers to yield to pedestrians in crosswalks – and, likewise, to convince pedestrians to be more careful when they’re crossing the street. There was a special effort last week, with the start of the fall semester, to highlight their efforts. 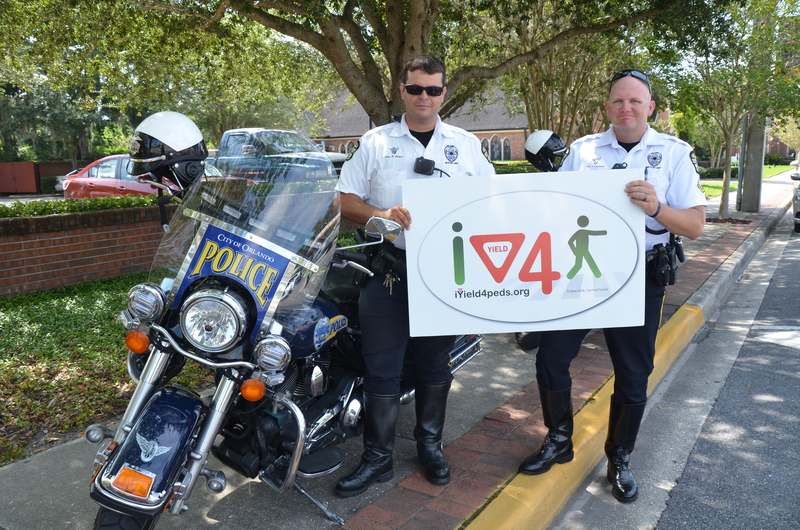 As part of that, the Orlando Police Department and Orange County Sheriff’s Office were out in full force reminding drivers to yield to pedestrians in marked crosswalks during Operation Best Foot Forward, held on Aug. 26. As Best Foot Forward notes, last year in Orange County, 74 children under the age of 14 collided with a car, so they arranged to have officers conducting enforcement details at 11 targeted crosswalks – including the one at Edgewater Drive and Shady Lane. Officers were placing a traffic cone or marking nearly 200 feet ahead of the crosswalk. As a car approached, a plain clothes officer attempted to cross the street, giving the driver time to yield. Those who didn’t were issued a warning — or a citation of $164 and three points on their license. More law enforcement efforts are planned in the fall. Day said when she gives public presentations on Best Foot Forward and asks people if they know what the law states about crosswalks: it is the driver, or the pedestrian, who has the right of way? A majority often say the driver – mistakenly, she added. This is a long-term project, and will be a slow process in a state where the car is king.